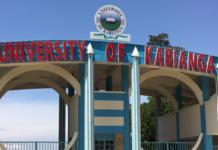 The Kenya Universities and Colleges Central Placement Service (KUCCPS) has completed the process of placing candidates who had applied for different courses after the first and second revision were done. The 2018 Candidates are expected to be admitted to different higher institution of learning for the 2019/2020 September Intake. A total of 89,486 students were placed to degree programmes in public and private universities. A total of 98,393 applicants were placed to TVET programmes (diploma, craft certificate and artisan certificate). Dr. Muragur said from May 1, 2019, KUCCPS portal will be open for students who wish to transfer their placement. NOTE: This procedure is only applicable for students who have been admitted for government sponsored programmes. Congratulations, followed by a university you have been placed then finally the course you will pursue.